In 2013, biologists made the startling discovery that our cells age for one reason: The breakdown in communication between the nucleus and the mitochondria. Amazingly, these researchers also discovered that one specific substance in our bodies — a compound known as NAD+ — can improve that vital communication, thus stopping or even reversing the causes of cellular aging. 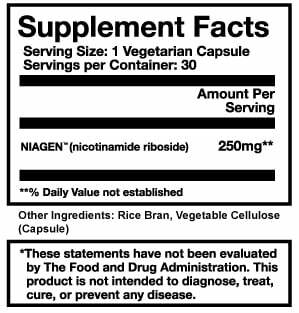 Niagen is the first product ever developed containing pure nicotinamide riboside, the only substance proven in multiple studies to increase levels of NAD+ in your body. For this reason, Niagen has been hailed as a groundbreaking discovery that has changed the way we view aging…forever. Niagen comes in a vegetarian capsule. Take 1 capsule in the morning with breakfast. 1 bottle contains 30 vegetarian capsules. Niagen is third party tested for safety and purity. The average order for new customers is 3 bottles and that’s what we recommend to start. But we do have many repeat customers, so you can enjoy our best pricing on the 6 bottle package. Each capsule contains 250mg of Niagentm, the first commercially available form of Nicotinamide Riboside that can safely be absorbed by the human body. Our capsules are vegetarian, free of lactose, gluten, additives and preservatives. It is packaged in a BPA-free dark amber glass bottle resistant to heat, light and air. Live Cell Research uses third party laboratory verification to guarantee we use only the highest quality ingredients and nothing else. How is Niagen different from other anti-aging supplements? Great question. Many Niagen users take a full regime of supplements (such as resveratrol, fish oil, glucosamine, etc.) and it’s important to note that Niagen is safe to take along with these other products. Also, these other supplements will NOT interfere with the effectiveness of Niagen…and that’s because Niagen works in a completely different way. Other types of supplements contain nutrients which may help with immune function or cardiovascular support, but Niagen works at the cellular level. 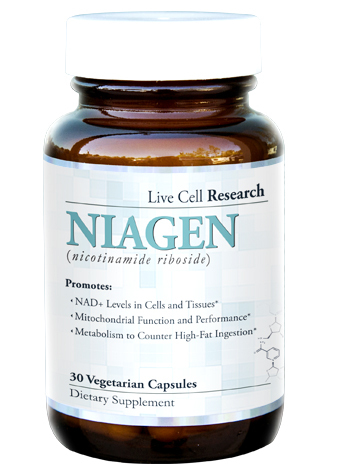 Niagen boosts a crucial compound known as (NAD+), which is essential for cellular metabolism. Niagen is the only known oral supplement to boost production of (NAD+). Take just one capsule per day first thing in the morning, ideally on an empty stomach and with a full glass of water. It is not necessary to refrigerate Niagen, although doing so will not impact its effectiveness. Nicotinamide Riboside is a naturally occurring nutrient found in milk and beer. As such, (NR) is safe to use and produces no known side-effects. Niagen is tested by an independent laboratory for safety, purity and potency. As always, consult with your physician before beginning any new supplements. How do I know if I’m a good candidate for Niagen? One of the amazing things about Niagen is it can work for anybody. Niagen is a unique product because it has been shown in laboratory studies to replenish a compound, (NAD+), which naturally gets depleted as you age. So especially if you have experienced fatigue, a loss of physical energy, and difficulty engaging in the activities you loved when you were younger…then you may benefit from Niagen. Yes. We offer you a 90-day money-back guarantee on any Live Cell Research purchase. If you’re anything but satisfied, return your order for a full refund of the purchase price. Try Niagen™ RISK-FREE for 90 Days! If you want the power to stop — or even reverse — aging on the cellular level, this is one of the most life-changing investments you will make to the quality of your life and we want to make the decision easy for you. If you are not 100% satisfied with your purchase, we DON’T want your money! It’s as simple as that. If you do not experience a dramatic improvement in your health and vitality, we want you to contact us for a full refund of your purchase price. There will be no questions asked and we will refund your money immediately. Click the link below to order and we will ship your purchase out immediately. You have 90 days to try Niagen and see the results yourself. If you are not 100% satisfied, simply contact us and we will gladly refund your money. The whole process takes just a few minutes and you'll receive your Niagen package in just a few business days.